Written by big wall master Chris McNamara, who personally climbed & painstakingly documented every route in his innovative "SuperTopo" format (SuperTopos include unprecedented route detail such as climbing strategy, retreat information, descent topos,pitch lengths, & gear recommendations for each pitch). 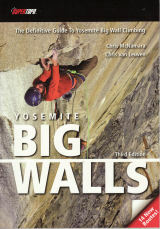 Yosemite Big Walls covers the 41 best big wall routes on El Capitan, Half Dome, and Washington Column. Also included is historical info garnered from interviews with first ascentionists that bringthese spectacular big wall climbs to life.